READ THE INTERVIEW WITH WARREN HAYNES! Do you have a story to tell? The 11th Hour wants to hear it! could find Karli Buchanan’s name there. A Junior Softball player at Howard High School, Karli excels academically, maintaining a 4.0 GPA and is ranked #11 in her class standings. • Karli occupies the position of catcher, and she is the lead off hitter for the Howard Softball team. • She is compassionate and driven, uplifting and inclusive. She is kind to everyone she meets and has a heart for students with special needs. She doesn’t make them feel different, but included, even providing rides to football games on Friday nights. RUNNING COMMENTARY For those of you who don’t listen to 100.9 The Creek or have never spent 11 minutes with me in any capacity or maybe this is the first time you’ve picked up this excellent (not-so-humble opinion) publication, I’m a professional wrestling fan. Wrasslin’. I confess that I haven’t followed the current incarnation of WWE since 2016 when I canceled my network subscription, but neither my consumption nor my enthusiasm has been affected in the slightest. For one thing, I have an extensive collection of classic, independent and Japanese wrestling matches. I’m also following the development of AEW with great interest. Second, collectors are discovering “new” found footage and matches and uploading to the Internet all the time. If I have a few minutes to waste, I can open a beer, search YouTube, and find some All Japan classic with Stan Hansen or an NWA gym show from the early ‘90s. I also love (read obsess) over the games. The Smackdown series that morphed into SvR that eventually evolved into 2K has cost me hours upon hours into days and months of trying to recreate my favorites wrestlers down to the laces on their boots and the scars on their heads. After my daughter was born, I slowed down on the gaming-- but once she started sleeping regular and afforded me an hour here and there, I found the Xbox controller back in my hands and WWE 2K14 back on the screen. Sure, there’d been new installments designed for next-gen consoles-- but I couldn’t and can’t afford one of those. And I didn’t need to. 2K14 had a retro Ric Flair and Dusty Rhodes (polka-dotted, but whatever), Jake Roberts and Rick Rude, HBK and the Hitman, Stone Cold and The Rock, Randy Savage and Ricky Steamboat… But it didn’t have Terry Funk. Terry Funk is my wrasslin’ hero. Using the creation suite, I’ve made Terry Funk for every WWE game produced since Smackdown: Know Your Role in 2000-- even the games where he actually appeared because the designers never made his tights right! See? Obsessed. On March 30th of this year, Ted Dibiase announced that Terry’s wife, Vicki Funk, had passed away at the age of 75. I remember when Johnny Cash (another hero) lost June Carter. I think I was more devastated by that news than I was later when John R. died. It was a harbinger, and I knew that the Man In Black wouldn’t be content on Earth when he knew June was waiting on him. I feel that same pain and fear now. Yesterday, my 2K14 game save became corrupted-- a bug or glitch common to the series as well as the Xbox 360. I lost it all, all the wrestlers I’d created-- Arn & Tully, Sabu & The Sheik, the Freebirds & the Von Erichs, Magnum TA, Barry Windham, and dozens more… But most importantly, I lost Terry Funk. I should’ve been angry, and I guess I was-- but it didn’t feel… like it meant anything. I considered starting over-- I’ve had to do it before. Instead, I sat and waited for my daughter to wake up from her nap. Once she was awake, I fixed her milk and put a handful of Goldfish crackers in a cup. We sat on the floor in the living room, and I turned on some old Terry Funk matches-- the old WWF less bloody variety where Terry played the heel to perfection. We watched and every now and again, Carter asked me who certain wrestlers were, what were they doing… And she’d point at the man from the Double Cross Ranch and say, “That’s Terry Funk!” My heart’s with you, Terry. 11TH ANNUAL MAGNOLIA SOAP BOX DERBY & GRAVITY RACE FREE! 10am-5pm Saturday, April 13 Magnolia Street, Macon One of Central Georgia’s biggest and best community events! The 11th Annual Magnolia Soap Box Derby is presented by Middle Georgia State University! This event is FREE and open to the community (as always!). Family Fun, Music & Food, and 45+ Race Teams! AUTISM SPIRIT DAY 12pm-10pm Saturday, April 13 Macon Swirls 5451 Bowman Rd Ste 230, Macon On April 13, Macon Swirls on Bowman Road will host their 3rd annual Autism Spirit Day. All proceeds will go towards fencing in Jayden’s Dream Inclusive Playground in Gray, an important safety addition since more than half of children with an autism diagnosis are prone to elopement. LINDSAY BEAVER LIVE! 10:30pm Saturday, April 13 The Creek Stage @ The Rookery 533 Cherry Street, Macon When blues-rocking, soul-singing drummer, songwriter, and bandleader Lindsay Beaver takes the stage, she makes an immediate and unforgettable impression. Standing front and center at her kit, singing every song from the depths of her soul, she delivers blues, R&B and old school rock ‘n’ roll with punk rock energy, and sings with a voice brimming with attitude and soulfulness. She comes at every song with urgent intensity, soul-baring emotion, a distinct swagger and a takeno-prisoners confidence. With influences ranging from Little Richard to The Ramones, from Billie Holiday to Queens of the Stone Age, Lindsay has crafted a timeless sound and personal style that simply cannot be denied. MY COUNTRY 'TIS OF THEE: THE UNITED STATES AIR FORCE ACADEMY BAND 3pm Sunday, April 14 Century of Flight Hanger Museum of Aviation 1942 Heritage Blvd, Robins AFB The United States Air Force Academy Band from Colorado Springs presents “My Country ‘Tis of Thee” at The Museum of Aviation’s Century of Flight Hanger in Warner Robins on Sunday, 14 April 2019 at 3:00 PM. This family-friendly event will feature the Concert Band in a program that highlights musical diversity and represents the excellence of our men and women in uniform. The concert is free and open to the public. No tickets are required for this event and seating is open for General Admission. NEW IN CENTRAL LARGE CRAFT BEER HOMEMADE DOUGH, GEORGIA SELECTION! continued from page 9 BRAGG JAM PRESENTS: SECOND SUNDAY WITH TRAE PIERCE & THE T-STONES 6pm Sunday, April 14 Coleman Hill 285 Spring Street, Macon Bragg Jam is excited to welcome Trae Pierce & the T-Stones to the first Second Sunday Concert of 2019! Trae Pierce & the T-Stones have developed a high-energy live show with a modern feel that also recalls the unstoppable grooves of Bootsy Collins: they “wants to funk you up!” Trae is a worldclass bassist and four-time Grammy Award-winner (with the legendary Blind Boys of Alabama) who cut his bass chops as a member of The Ohio Players. GRANDKIDS: PETE THE CAT 9:30am Wednesday, April 18 The Original Acai BowlOpera House Grand 651 Mulberry Street, Macon ​Reckless Kelly’s string of critically acclaimed albums-- When Pete the Cat gets caught rocking out after bedtime, the catcatcher sends him to live with the Biddle family to learn his manners –– and boy are they square! But for the groovy blue cat, life is an adventure no matter where you wind up, so the minute Pete walks in the door, he gets the whole family rocking! Recommended Ages: Pre-K through 3. Tickets are $7.50 and can be purchased at thegrandmacon.com. OPEN MONDAY - FRIDAY 7 A.M. - 2:30 P.M. & FIRST FRIDAY’S FROM 5-9 P.M.
HOLIDAY SUPER JAM FEAT. TANK & MARSHA AMBROSIUS 8pm Thursday, April 19 415 1st Street, Macon Itâ&#x20AC;&#x2122;ll be a night filled with R&B favorites from superstar Tank! Also featuring the soulful sounds of Marsha Ambrosius! Tickets are $49-$99+ and can be purchased at ticketmaster.com. WILL HOGE LIVE! 9:30pm Thursday, April 19 The Creek Stage at The Rookery 533 Cherry Street, Macon Will Hoge has never been afraid to wade into political territory, like with 2004's The America EP ("Bible Vs. Gun," "Hey Mr. President (Anyone But You)") or 2012's Modern American Protest Music ("Ballad of Trayvon Martin," "Jesus Came to Tennesseeâ&#x20AC;?) and the point of this new material is to continue to push Hoge-- and his listeners-- even further outside of the comfort zone. Also featuring Canadian turned Texan singer-songwriter Brandy Zdan. Tickets are $20-$25 and can be purchased online at hargraycapitoltheatre.com or in person at The Rookery. SENSORY FRIENDLY MOVIE: WONDER PARK 11am Friday, April 20 Amstar Macon 5996 Zebulon Rd Amstar Macon will host a sensory-friendly viewing of Wonder Park on April 20 at 11 am-- for these viewings, lights are turned up, sound is turned down, and audience members are free to move around the theater however they need to. THE MACON FILM GUILD PRESENTS: WHO WILL WRITE OUR HISTORY 7:30pm Tuesday, April 23 The Douglass Theatre 355 Martin Luther King Jr Blvd, Macon During World War II, a clandestine group of Jewish journalists, scholars, and community leaders in the Warsaw Ghetto vowed to defeat Nazi lies and propaganda not with weapons but with pen and paper. Led by historian Emanuel Ringelblum, they chronicled their daily lives as a testament of survival, then as an indictment of wartime atrocities. Tickets are $5 and can be purchased at the box office or online at douglasstheatre.org. EARTH DAY MACON-BIBB 2019 4pm-7pm Wednesday, April 24 Tattnall Square Park 1155 College Street, Macon This year's global Earth Day theme is "Protect Our Species." This year’s festival will feature live music, demonstrations, live animals, The Mulberry Market, and more! GEORGIAâ&#x20AC;&#x2122;S LARGEST RV DEALER WITH OVER 350 RVs IN STOCK! The camping experts, since 1989. All prices exclude tax, tag/title, and documentation fees. Financing examples assume 20% down, with qualifying credit. did not like the term "Southern Rock". And it kind of struck me because I've heard a lot of artists and musicians from that era say the same thing. Do you feel the same way about that phrase "Southern Rock"? And if so, why? Well, I know that most of the original members of the Allman Brothers didn't like that term. Gregg talked quite often about it and he even thought it was a bit redundant seeing as how rock music came from the South in the first place. I think the thing that most of us didn't like about that term was any of the negative connotations that would be associated with it. Whether it was a rebel flag or racism or some of the things that tended to get lumped in with the term "Southern Rock". And I feel like, since the Allman Brothers kind of started the whole thing in the first place, it was their prerogative to disown the title so to speak. But I think a lot of people identified with it in a positive way and just felt like there was a category that describes music that they loved. So in that way, I think it's okay. It's just the negative connotations that kind of rubbed everybody the wrong way. For instance, there's a magazine in Germany called Southern Rock Magazine and part of their logo has a rebel flag in the logo. So they were interviewing me over there one time and I told them that in America, that's an offensive symbol. And they didn't tend to look at it that way. They didn't realize the history. They didn't recognize it as being anything other than a positive thing. So, I had to explain that to them. But I think there was so much great music that came under the heading of Southern Rock that as long as people think of it in a positive manner, I'm okay with it. Back in 1994 when Gov't Mule first began, you all were staying in Macon. Since that time, the city has made some very dramatic changes. What was the downtown scene like when you were hanging out around here? During that time, I think they were starting to renovate the area. When we were hanging there, we were just soaking up the vibe and the history of the town. We were all living at The Big House house and it was a really positive experience for us. Each time I go back to Macon now, I see all the new restaurants and businesses and just the way it's kind of flourishing along with a lot of other southern towns, including the one where I'm from. There's a lot of positive change happening, and what I really like is the local aspect of it and how the people are really nurturing the community. N O RI W N G ! I just feel like it's an amazing opportunity to do something that weâ&#x20AC;&#x2122;re all going to be doing every day anyway-which is playing music. And to be able to turn that into building houses for people that need homes? You know, sometimes when you get a taste of how easy it is to give back, it makes no sense not to. the amazing Marcus King. I had a chance to interview Marcus a couple of years ago, and he spoke glowingly about the relationship that you two have. Talk to me about meeting Marcus and what that relationship means to you. Well, when I first heard Marcus, he was seventeen and already very talented-- and obviously had a bright future ahead of him. And it reminded me in some ways of meeting Derek for the first time, although Derek was eleven when I met him. It's very rare that you hear someone that has that kind of maturity, musically speaking, at a young age and you know that it's only going to get better. We used to always talk about what's going to happen to Derek once he gets his heart broken (laughing). When you're 11-years-old, you've only experienced a small part of life and when you see someone like that come along-- that you just know is going to continue to grow-you know, it's very inspiring. And finally, is the band working on any kind of new material, anything new coming out in the near future? We recorded and filmed two nights at The Capitol Theatre in Port Chester, New York, and the next release is going to be a double DVD/double CD combination from those shows. And in some ways, it will mark 25 years of our career. I'm very excited to get that out as soon as we can. We're going to be working on new material. We've started kind of working on some instrumental music that's more akin to some of the stuff we did in the early days, so I have no idea where all the new music's going to wind up. BY SCOTT MITCHELL Scott Mitchell is the owner of Travis Jean Emporium and is the co-host of Deconstructing Divas on 100.9 The Creek. He enjoys spending time with his family and furbabies, volunteering, gardening, traveling, watching Broadway shows, and cheering on the Georgia Bulldogs. In August of 2016, I met Ashley Doolin when she moved here with her husband to help begin Central Georgia’s coolest radio station, 100.9 The Creek. We quickly became best friends and discovered that we shared a love of female artists. Later that year, we pitched the idea of a onehour show dedicated to women in the music industry-- and Deconstructing Divas was born! The Creek took a chance on our idea and has given us space to create something truly unique and inspiring. Each episode, we look at a different female artist’s life, legacy, and influence on the next generation of great singers, songwriters, and musicians. We have been able to interview some of our biggest influences and have shared some amazing concert moments over the past couple of years including a shout out from Mavis Staples when she performed in Macon. Working on Divas has really opened my eyes to the injustices that many female artists face. The research that goes into each episode always opens my eyes to the unparalleled strength and determination these women possess. I asked Ashley to tell us more about why Divas is so important in a place like Macon. She explained, “The South, for so long, has been set in its ways by a maledominated society. These women clawed and fought for their place in music history. We use our show to tell their stories-- good, bad, and ugly-- to give young girls positive, strong role models. We want women and girls to know that there have been women before them that have gone through some of the same challenges and made it. Our central message is-- Never give up!” On April 14th we will celebrate our 50th episode with a listening party starting at noon at Travis Jean Emporium, our awesome sponsor! Ashley and I cannot wait to share fifty more episodes with you! DOWN HILL FROM HERE! THE MAGNOLIA SOAP BOX DERBY RETURNS! It’s one of the most anticipated days in Central Georgia-- the Magnolia Soap Box Derby! Whether you’re a new team out for your first run at glory, a returning crew ready for your next opportunity, or one of the thousands (and thousands) of spectators, this event is a community highlight every year. 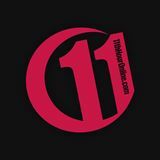 This will mark the 11th annual derby and promises to be the grandest yet. Come for the races that show off marvels of engineering, imagination, and of course, speed! We’ve put together 11 team profiles (11 teams from the 11th derby in the 11th Hour-- wanna guess how many minutes it took us to come up with that?) 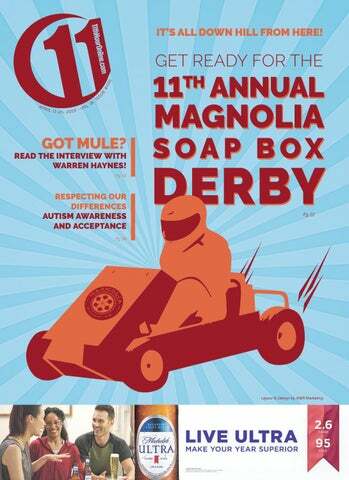 to celebrate and get you ready for this year’s biggest and best Magnolia Soap Box Derby ever! Graced Lightning Team Motto: Ezekiel 1:12-13 "Why this car is ecologic… it’s chronologic… it’s theologic. It’s Graced Lightning!" Our team name “Graced Lightning” draws its inspiration from the movie “Grease” and the first vision of the prophet Ezekiel. “And each one went straight forward; they went wherever the spirit wanted to go, and they did not turn when they went As for the likeness of the living creatures, their appearance was like burning coals of fire… The fire was bright, and out of the fire went lightning.” Ezekiel 1:12-13 Deacons, members, and friends of Highland Hills Baptist Church comprise this not-so-pious pit crew of all sinners and saints. The congregation of Highland Hills enthusiastically supports the space for community and competition kindled in Macon by the Magnolia Street Derby. We give thanks for open spaces where all people are welcome. This team of sinners and saints, winners in the 2018 Magnolia Soapbox Derby, will spend their days preparing for the race and praying that lightning strikes twice. Hammer Down Team Motto: “Sheridan Construction doesn’t just build buildings, we build winning soapbox derby cars too!” Sheridan Construction is participating in the Magnolia Soapbox Derby this year for the first time. We are excited to have great participation from our employees. We have about 16 people committed at some level to our team. We recently acquired a car that is currently being retrofitted for our team. Our team name is Hammer Down (pun intended). Our song will be “U Can’t Touch This” by MC Hammer (pun intended again). Shea Smith, our Controller, has graciously volunteered to pilot this magnificent beast. The car in the photos is the original version that you will not recognize on race day. Race day design will be revealed on the big day. Our mission is to serve our clients, community, and employees with excellence, integrity, and quality in every aspect of the construction process. Come see us at our Sheridan Construction tent for the big reveal. Float Daze Team Motto: “Cleaning up the competition!” Float Daze is a Macon Georgia community organization that spends our summers on the river. Originally starting as a small group floating the Ocmulgee River in 2015, we’re now over 3000 members strong. Float Daze is known for our massive group floats and hosting river and trail cleanups all year long at Amerson River Park. We’ve taken thousands of pounds of trash from the Ocmulgee River. Completely organized and funded by volunteers who just love being out on the water. We love playing a part in our community and joining in other Macon events. We started racing the soapbox derby last year and we had a blast, taking 1st in best in show and 2nd in professional. Nothing better then everyone coming out for some friendly competition in downtown Macon. We have our eyes set on the gold this year, racing in both the shadetree and the professional division. It’s such a great event for our city-- everyone coming together, hanging out in the park watching your buddies fly down the hill in a homemade racer. We can’t wait for this event every year and have plans to participate for years to come. Bennett Law & Mediation Services LLC The Magnolia Soapbox Derby has always been a special event that both Andrew and I look forward to each year as we have always valued the sense of pride and community it brings to Middle Georgia. We not only look forward to attending every year with friends and family but also strive to participate in the race every year as well-regardless of which team we are associated with. After participating with the Steak ‘N Shake team, the sense of pride and community I felt flooded into my next team when I organized the continued involvement of the Sell & Melton LLP car. Andrew organized and led the Mercer Law “Legal Eagle” team in 2017 and continued the tradition again the following year. Andrew led his team to victory placing in the top 10 in both 2017 and 2018. Although winning was a thrill, it was the sense of community connection and team building that prompted Andrew’s continued involvement. Our love for the Derby lives on with our own law firm, Bennett Law & Mediation Services LLC. I know that our continued involvement in the Derby will bring us closer together as a firm, a team, and as a community. I look forward to this being the best year yet! Our family chose to enter the Magnolia Soapbox Derby for many reasons. We enjoy spending quality time together and trying new adventures. We try to have the children remain tied to nature and outdoor activities as much as possible to avoid constant connection to the gaming and internet world. We felt this would be a great way for them to gain insight and valuable life lessons about the different trades and teamwork that are involved in a worthwhile endeavor. The whole family has enjoyed working on the derby car from its concept to the finished product. Our children may be young, but they are learning lifelong skills and values about how to discuss ideas and bring them to fruition. They are working on the mechanics of putting together the car and the effort that is required to make a winning team. (We hope it will be a winner!!) This is a fun, new experience for the whole family, and we eagerly look forward to “race day”. We know it will be a winning day for us even if we do not come home with the top trophy as we will have spent time together surrounded by others sharing a fun exciting day of adventure. TidyBum Racing Team Motto: "Travel Tidy, Fast, and Safe!" The TidyBum Racing team consists of myself (Wendel), my wife Carol Nelson, and two guys that have worked with me at Mercedes Benz / Volvo of Macon for the last 11 years. Last year we all worked together to build a safe, fast Derby racer, and we succeeded. So we decided to do as Mercedes Benz and Volvo do with Racing or Performance models: Take your history and build the next one more beautiful, faster, and safer. TidyBum Racing uses recycled parts-- as TidyBum does-- so we leave as little a mark on our Earth as possible. We are ready to go Safely, go Faster, and brake Better. Bloomfield Community Center Last year, like so many others, we were happy to be able to participate in the Magnolia Soapbox derby race. To start S.T.E.M. in Parks and Recreation is a task but a noble one. Each step of the way we learned something. In particular, what teamwork means. When it all was said and done, we had our soapbox, but something was missing. We needed a driver. Her name was Bre’shanna (pronounced Bray) Daniels. She went to Southwest, but she now goes to Windsor Academy. She is a top academic student as well as a top basketball player who likes to try different things. She is on the shooting team as well. Her mother drives trucks and has always encouraged her to do whatever she wants. We came in third place our first year in the shade tree category. It was interesting watching all the joyous faces and wonderful smiles taking place and knowing you were part of it. This has meant so much to us. Here we are trying to find a way to spark our S.T.E.M. program and it ended up sparking us. When you see the smile on Bre’shanna’s face along with her mother’s, you know why this race exists. You know that it touches the lives of us all in Middle Georgia. And, by the way, she will be with us again this year. We can’t wait!!! The Mentors Project The Mentors Project provides one on one as well as group mentoring to Bibb County middle and high school students. The program also provides wraparound services which include but are not limited to food, clothing, school supplies, transportation, and housing on an as need basis. Monthly events focus on financial literacy, teen pregnancy prevention, interviewing and communication skills as well as an academic summer program which includes Leadership Academy, STEM, and a Book Club. Cherry Street Ink Supporting the Magnolia Street Soap Box Derby has always been one of the highlights of the year for us. When we were approached with the opportunity to actually participate from beyond the sidelines we didn’t hesitate. Even though none of us have a clue what we are doing we are looking forward to race day! Freeman Cabinets Freeman Cabinets is very happy to be racing and sponsoring the Magnolia Soap Box Derby for the 4th year! We truly believe this is one of Macon's best days of the year and are happy that our community can come together and support Middle Georgia STEM programs as well as have a ton of fun with all our wacky friends and neighbors! The Creek Team Motto: “We’re not in it to win it, we’re in it for style!” This year marks the third derby for the Creek crew, and just like in years past, we’re comin’ to be seen! Win or lose, we’ll be lookin’ good-- but in all honesty, it’s a bigger thrill just to be involved with the Magnolia Soap Box Derby. It’s not the spirit of competition that brings everyone together, it’s the sense of true community. Good luck to you all! BEET & BURRATA SALAD AND POACHED COVINA EDGAR’S BISTRO 5171 EISENHOWER PARKWAY SUITE E, MACON Vibrant and expertly prepared food in a relaxing environment-- that’s fine dining in any arena. Tucked away in Helms College and part of Goodwill Industries of Middle Georgia and the CSRA, Edgar’s Bistro could be the best-kept secret in Central Georgia-- and if it’s not on your radar it should be. “We like to say you come hungry and leave fulfilled,” smiles Angie Harben, Senior Director of Communications. The staff at Edgar’s is comprised of Helms College students who get to learn the ins and outs of hospitality and restaurant service. “It’s a combination of education and real-world experience,” says Angie. “We’re bridging the gap and creating pathways for people. And the food is amazing!” Take the unique Beet & Burrata Salad-- earthy beets paired with ricotta stuffed mozzarella, roasted turnips, heirloom baby carrots, and toasted pecans over frisee and arugula. Combined with a zingy lemon ginger vinaigrette with a beautiful bite, “It’s festive, a lot a flavor,” says Executive Chef Gerard McGale. “The colors make it sizzle!” And for the main event, try the Poached Covina! “I love the poached fish, nice and clean,” admires Chef McGale. Like the salad, the entree is full of fresh colors and flavors from honey lemon sweet potatoes, broccoli, and a trio of mussels, clams, and oysters prepared on the half-shell. Edgar’s Bistro offers brunch every first Sunday of the month-- but make your reservations now for special Easter and Mother’s Day brunches-- and provides live music on the last Thursday of the month. From the food to the service and the atmosphere, Chef McGale grins and affirms that Edgar’s, “is a dining, culinary experience!" Carter and I work 100 hour weeks. I don't say that because I am looking for a pat on the back, I say that to show you just how much Z Beans means to us. When something means the world to you, when you give your all to something, it's hard to accept criticism. We are all fallacy ridden-- none of us are perfect. We know that. But for someone to criticize your work? For someone to denounce what you have worked so hard to build? It cuts deep. As I sat in church today, I listened to the pastor discuss the concept of whether or not a leader decides to be right or be light. Immediately, these thoughts jumped into my mind. I started thinking about the 1-star reviews on Google, the negative comments that have made their way back to me, and the individuals who have decided to denounce the very thing that means the most to me. I began reflecting on the times in which I first encountered the negative comments. I felt the anger once again, the confusion, the misunderstanding-- and the hatred. As I continued to listen, I reflected on one particular message-- the importance of living at peace with everyone. What does that mean? At peace? Is my inability to live at peace the very factor that drives me? If I live at peace, what must I sacrifice? I continued to ponder this statement as I walked out of church. An hour into my thoughts, my father, who has always sent me inspirational quotes, sends me an unrelated text message: "Face your problems - don't hide from them." Immediately, it hit me. Z Beans' biggest critics are the ones who actually help me the most. I don't have to go out and find my problems-- they tell me! By understanding this simple message, the entire puzzle comes together. By understanding that the critics are here to actually help me grow, I'm able to live at peace. I'm at peace with them, and most importantly, I'm at peace with myself. I channel my energy into solving the problems laid before me. In doing so, I'm able to push Z Beans in the right direction. To be at peace with everyone is to face your problems and not hide from them. To face your problems and not hide from them is to be a leader. And to be a leader is to be a light-- not the one who is always right. pill to swallow, but one that I managed to get down thanks to my Burger King Return of the Jedi commemorative drinking glasses. A lot of people standing knee-deep in the midlife crisis hoopla also find themselves making a flashy purchase-- like a little red convertible or an expensive new gadget. In my case, I combined the two and went all in on a new electric skateboard. Indeed, it was my preorder of the newly unveiled Onewheel Pint that really caught our attention and prompted that dreaded question, “What the hell am I doing?” Well, I don’t presume to know what I’m doing or where I’m going. All I know is I’ve got my Siouxsie and the Banshees t-shirt on, and I’m gonna carve up these streets on my futuristic skateboard like an absolute boss. Bo Walker is a local writer and comedian who is living his best life, mid-life crisis be damned! All parenting can be difficult-- that’s just part of the job-- but parenting a child with a disability can be especially hard because we don’t live in a world that’s set up to accommodate differences. The newest CDC numbers state that children are diagnosed with autism spectrum disorder, a developmental neurological condition that affects language and communication, sensory processing, motor skills, and social interaction. These numbers create false panic in some, but they’re largely the result of better and more comprehensive diagnostic testing and increased access to healthcare for previously underserved populations. Disability is and has always been a natural part of the human experience, but sadly many of us are still made deeply uncomfortable when faced with these differences. I know this because my daughter Ramona, now 10, was diagnosed with autism at age two. if you could afford to send them to the right therapists for twenty-plus hours a week. None of this felt reassuring or manageable. I’m lucky that I soon stumbled upon what I now consider the greatest resource available on the topic: actual autistic adults writing with candor and intelligence about their experiences. Thanks to the work of groundbreakers like Julia Bascom, Lydia X. Z. Brown, Ido Kedar, and Nick Walker, I gained a profoundly paradigm-shifting view of autism. The concept of neurodiversity-- the fact that variations in human neurology are normal and should be respected-- resonated greatly with me. I stopped silently biting my tongue when people responded to Ramona’s diagnosis with a concerned face and an, “Aww, I’m sorry/ poor thing/that must be so hard,” and started fiercely advocating for my child’s right to exist in the world exactly as she is. I counteracted misguided sympathy with stories of how Ramona’s the funniest, silliest, most exuberant kid I’ve ever known-- she doesn’t need pity, and neither do I. Pity is dehumanizing, belittling-she deserves respect, and it’s my job to be sure she gets it. I learned to appreciate the beauty of Ramona’s unique mindset, and started working to figure out how best to meet her sometimescomplex needs and help her have a happy, safe, and fulfilling life. little corner of the world you’re in charge of more accessible to everyone, and then implement those changes. Practice empathy, kindness, inclusion. Attend one of the local events below, or connect with one of the charities to see how you can volunteer at future events, even if you don’t have skin in the game – people with autism are fun to hang out with, and it’s good to get out of your comfort zone and gain some perspective. If you’re a parent and you think your child might be on the spectrum, don’t be scared – reach out to one of the local agencies below, find a support group on Facebook and ask questions, search for blogs and books written by autistic authors, and try not to fear the stigma of a diagnosis – it’s scary and alienating, yes, but it’s also an incredibly fascinating journey, and there are so many good people who will help you figure out where you need to go and how to get there. Spring has sprung and in Central Georgia that means you-pick-em-strawberries! Take advantage of all the amazing local farms we have. Bring the kids along and pick until you're picked out! Then head home, wash those ruby gems up, and whip up an amazing skillet cobbler! 4 oz room temp cream cheese 3/4 C plus 2 tblsp sugar 1 vanilla bean, split and scraped 1/2 C (1 stick) unsalted butter 4 C fresh strawberries, hulled and halved 1 C all-purpose flour 2 tsp baking powder Pinch of sea salt 1 C Whole Milk Whipped Cream, ice cream or even clotted cream (optional) Heat oven to 350 degrees. In a small bowl, combine cream cheese, 2 tblsp sugar, and vanilla bean seeds. Stir until completely smooth. Place butter in a large cast-iron skillet, melt butter until it is lightly brown, approx 8-10 min in the oven. In a large bowl, whisk together flour, baking soda, and salt. Stir in milk and the remaining sugar. Remove skillet and pour the browned butter into the batter, stir. HONKY TONK HELL Honky Tonk Hell is home to the pioneers and architects of Americana. Here, you’ll find atomic hillbillies, buckets of blues, and the restless rebels of early rock n’ roll. Explore lost highways and hop the mystery train as it rolls out of the Golden Age of old time radio and into a revival for the Modern Era. Trace the roots of Americana to Honky Tonk Hell. Aaron Irons was born in the green mountains of West Virginia but calls Macon, Georgia his home. He was a founding member of the influential rock n’ roll band, The Liabilities. He enjoys the Westerns of John Wayne, the “Dead” films of Romero, and the history of professional wrestling in the United States and Japan. Join Aaron Irons and take a ride through Honky Honk Hell every Tuesday at 7 p.m. on 100.9 The Creek. THE CREEK STAGE @ THE ROOKERY Lindsay Beaver 10:30pm FREE! THE CREEK STAGE @ THE ROOKERY Teddy and The Rough Riders FREE! NEW ISSUE ON STANDS APRIL 25TH! 10% OFF SERVICE AGREEMENTS When you mention this ad. TELEPHONE: 478.741.6655 PROUDLY SERVING MACON IN OUR 29TH YEAR!